The husband-and-wife pair of Katie Monahan Prudent and Henri Prudent captained opposing teams in this year’s Nespresso Battle of the Sexes on Saturday, Jan. 28 at the Winter Equestrian Festival. At the end of the night, the women’s team came out ahead with a score of 29 points to the men’s 17. 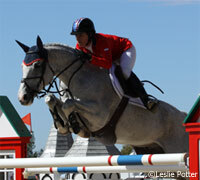 The women have dominated this event since it was launched at the Winter Equestrian Festival in 2009. Both teams included well-known show jumpers, including Margie Engle and Laura Kraut on the women’s side and Todd Minikus and Nick Skelton on the men’s team. In the first round of competition, the speed round, Michael Murphy turned in the winning round with 58.424 seconds. Catherine Pasmore was the fastest on the women’s team with a time of 59.010. The second round is the match race, where two competitors complete identical courses at the same time. The women won seven of the 10 rounds, pulling ahead to a clear lead. The six-bar competition was the final round, and the women continued to dominate. 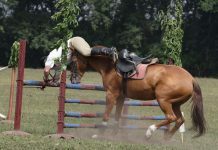 Each rider earned two points for their team with every clear round. The women took 16 points to the men’s 10 in this event, securing their victory. Well done to the women again! Girls Rule!! Way to Go Girls. Well done and the women show their superiority again……lol we are just so good at trampling the men they should just stay under our feet hahah….